In general, I like to alternate heavier meals (like last night’s Chicken Cordon Bleu) with something a bit lighter. 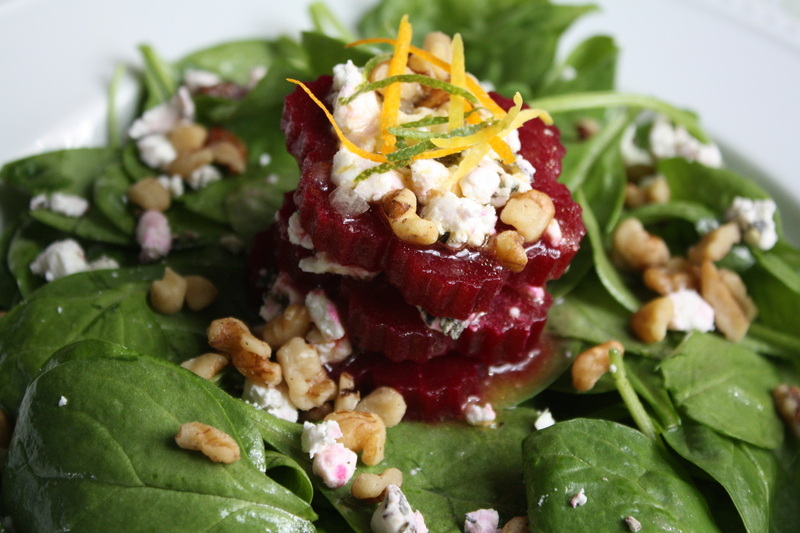 A fresh salad of spinach in a citrus vinaigrette with beets and a bit of herbed goat cheese seemed perfect tonight. Since my hubby always likes to have some sort of meat or fish protein with dinner, I’m also roasting up a few Sweet Apple Chicken sausages. But the real star of tonight’s dinner is the salad. 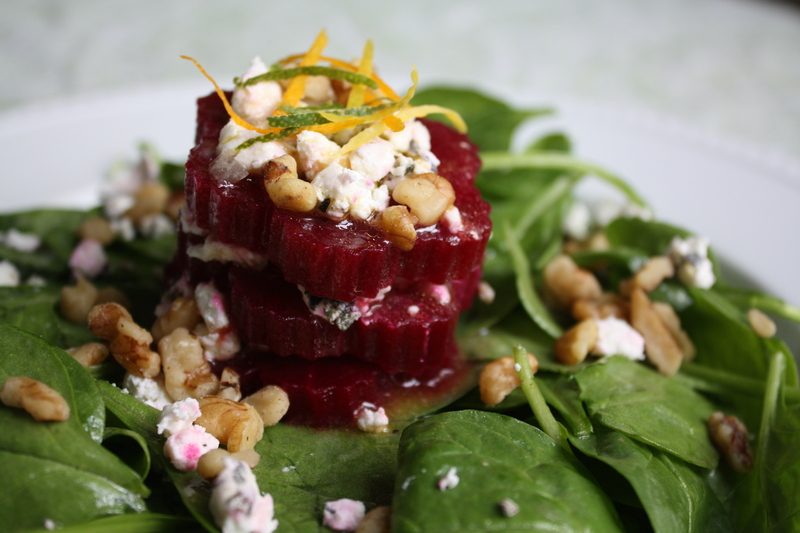 I’ve made beet salads a few different ways, sometimes slicing and stacking the beets, other times cutting them into little cubes. Today it occurred to me that I could have a little fun with the stacked beets. So, I pulled out my bin of cookie cutters to find one which would be the right size for my beets. Apparently, my cookie cutter bin has a magnetic pull on my three-year-old. He was content in the living room playing with his cars and motorcycles, but the moment the bin came out, he was magically by my side asking to help. How can I say no to my little sous chef? Little chef, making teddy bear and gingerbread man shaped beets. This particular little sous chef happens to be quite the picky eater, albeit a very eager and creative chef. He was the mastermind behind Ice Cream Pizza, the artist behind teddy bear beets, and has recently been suggesting I make Vanilla Soup. (I’m still working on that one.) He’d eat peanut butter and jelly sandwiches and popcorn for breakfast, lunch, and dinner, every single day, if I let him. Which, much to his dismay, I do not. I just keep plugging along, exposing him to a variety of foods and hoping that if he’s hungry, he’ll eat. But it’s also my hope that by involving him in so much of the cooking process, he’ll be more likely to try new things. We’ll get there eventually. Preheat oven to 350 degrees. Cut off the top and bottom of the beets. Wrap the beets in foil. Make sure they are thoroughly wrapped. Place the foil packet of beets in a baking dish on the middle oven rack. Cook for 1-2 hours, depending on the size of the beets, until the tip of a knife inserts easily. Cool. Using a knife, remove the skin. Slice or cut as desired. For the dressing, combine all ingredients. (You should have about 1/2 cup combined juice from the orange, lemon, and lime.) Whisk to combine. Season with salt and pepper. Add additional olive oil, if desired. Toss the spinach in a little dressing. 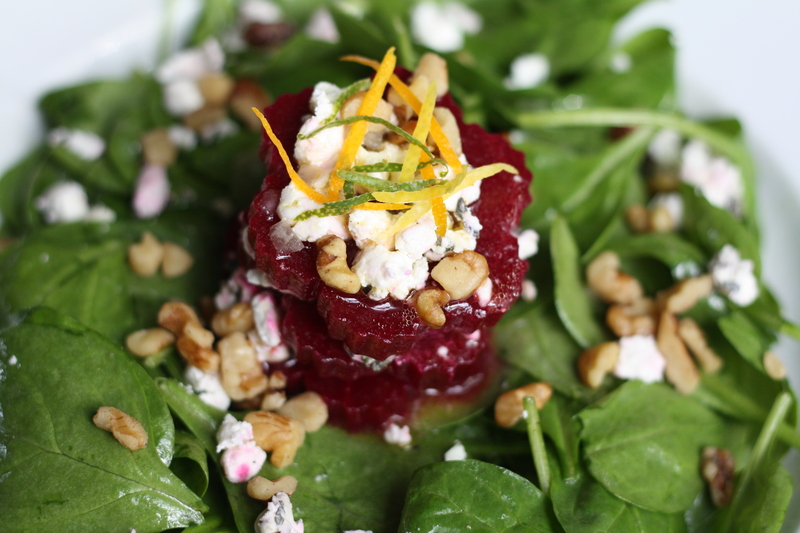 Create a tower of alternating layers of roasted beet slices and goat cheese. Drizzle a little extra dressing on top. Sprinkle with chopped walnuts and citrus zest. Posted in Cheese, Cooking with Kids, Dressings and Condiments, Food, Recipes, Salads and tagged cheese, Cooking, cooking with kids, Eating, Food, food photography, kids, parenting, Recipes, salad. Bookmark the permalink. 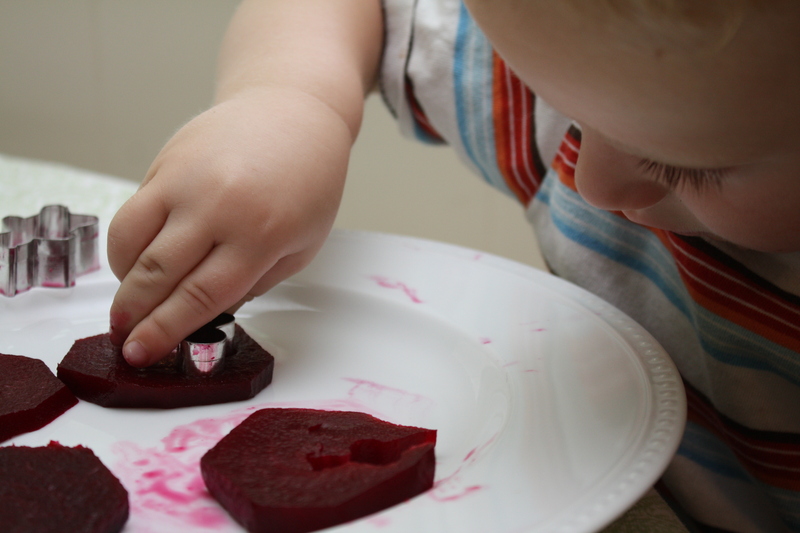 Little chef is adorable….great idea to have kids help out with the beets….